Southborough Police and a targeted family are alerting the public about a blackmail scam. A Southborough resident brought an extortion letter to police that he received in the mail. 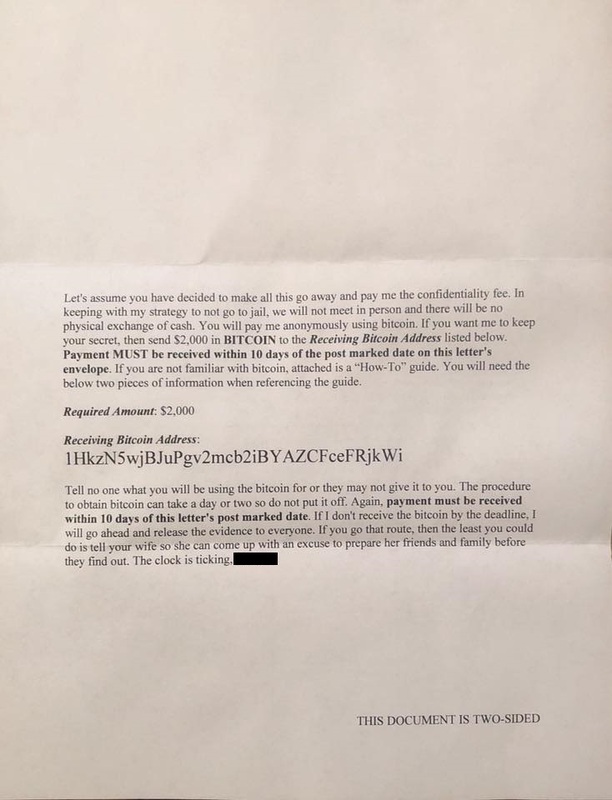 The sender attempted to extort a $2,000 bitcoin payment. The blackmailer targeted a married man, claiming to have unspecified evidence of his “misbehavior” and threatening to humiliate his wife if payment wasn’t made. Southborough Police shared some information in a Facebook warning. There are obvious signs (within the letter) that show the wording had been copied & pasted, in order to change out the name and address of the victim. PLEASE BE ADVISED THAT THIS IS A SCAM. IF YOU HAVE RECEIVED ONE OF THESE LETTERS IN THE MAIL: DO NOT SEND MONEY. PLEASE SHARE THIS WARNING WITH FRIENDS AND FAMILY. The targeted man’s wife also posted images of the letter on a Facebook group yesterday to warn others about the scam. She wrote that they found a similar letter online. I know about the secret you are keeping from your wife. More importantly, I have evidence of what you have been hiding. I won’t go into the specifics here in case your wife intercepts this, but you know what I am talking about. . . It is just your bad luck that I stumbled across your misadventures while working a job around Southborough. I then put in more time than I probably should have looking into your life. . .
even if you decide to come clean with your wife, it won’t protect her from the humiliation she will feel when her friends and family find out your sordid details from me. We got one of these too. Planned on bringing it to the police station – but I see others had the same idea. Thanks for the posting. I received one of these today. I live in Los Angeles. The letter was postmarked from Nashville, Tennessee. I received one of these today also postmarked Memphis, TN The Fed’s and Secret Service needs to round up all these Russians and Facilitators in USA to put some bite into some Law and Order. They must be on crack if they think I am going to fork over 1 penny. This is pure blackmail lottery where they hope to get lucky with someone and through fear of the unknown they pay. BS if you pay anything you will be hounded to death for more. Best advice report the blackmail to FBI maybe they will pin it on Trump of one of his attorney’s. Down with scams cryptocurrency and Russians ! Just received mine today as well. Live just outside of Chicago. Postmarked from Nashville also. Showed up on October 27th at our home in New Hampshire. I could tell it was a scam right away. Also postmarked from Nashville TN. Police might want to investigate a handful of folks that recently joined this group in Nashville. Please stop jumping to conclusions because people are interested in BitCoin and this scammer wants to get paid by BitCoin. If it doesn’t turn out to be Kenny Powers than I’m pretty sure it’s a kid. Aside from overly muscular use of cliches, there’s no mention of informing co-workers or associates, only friends and family. I received this exact same letter too on Oct 27th. Also postmarked from Nashville. It’s hard to follow the logic of “I won’t go into specifics in case your wife intercepts this…” As if the wife won’t be concerned because there’s no mention of specifics… huh?? I received the same letter. I live in Vermont. Letter was postmarked Nashville. I received one 11/20 in Little Rock. Postmarked Nashville. I’d like to know if all of us have anything in common and why we were the one to receive the letters. I am an investor in BitCoin, and thought these brokers weren’t able to be hacked, is this a common link we share?? I’m not a bitcoin investor. but you’re right, we’re probably on some list of some sort that got hacked into and stolen. I got this same letter today. And I don’t have a bitcoin account either. I received a similar letter.What we may have on common is a LinkedIn account. They had a security breach recently and my email and password were compromised….upon researching the breach I found out that the hacker sold the email and passwords acquired on the dark web to a Russian crime forum.Your letter sender (or at least mine had Russian name in email…..Change all passwords!!!!!! Not a bitcoin investor. It could be related to the Experian hack, a common restaurant, who knows. There’s no personal information in the letters that couldn’t be obtained through using the same lists that junk mailers use. I think more recent targets could be based on income (of zip code) and/or profession. Companies like Equifax sell this data about us all the time. Look up “data brokers”. * those who don’t realize they’ve been hacked yet!! I wonder if this is related to the guy running 5smining that was trying to be elected, ironically as state representative of Tennessee. 5smining was a bitcoin cloud mining service. He shut down the site and stole all the bitcoin. Did your (and Anonymous’) letter look identical to the ones we received out of Nashville, TN back on 11/20/2017? We received a letter in Kirkland, WA on January 27th too. I received one in Fairfield, Connecticut today. It was postmarked 2/12/18 in Charlotte, North Carolina. I got one today as well. Post marked February 12 from Greensborough N.C. Exact same language. Could it be from Equifax hack? Ahhhhh….I just cracked the case. Since no one has called my by my full given first name since 4th grade-the fraudster is Sister Margaret Anne!!! We received one today in Winnetka, IL (Suburb north of Chicago). Same exact language. Postmarked from Evansville on April 3rd. I got the letter today. Interesting to note, I got mine at a second home I own in California. I live in Nevada. Not married and have no secrets worth $8,150.00. I was notified by Equifax that I got hacked and been vigilant about info. BTW, mine was sent from Evansville, IN. I wonder if the Nigerian Prices have emigrated to the US. This has nothing to do with the Equifax breach. Ok – just got mine – san jose,post mark Birmingham Al. 4-19-18. from BadStar 89 for $8,700. requesting bit coin. I will go with the equifax as the root. also put a block on account. This is a scam. why is this not a fed crime? or fed looking into this? It is a federal crime, but feds have absolutely no way to track the bitcoin wallet suckers send money to. Unless someone is incredibly stupid in their mailing, nothing can stop it. We got one last week, postmarked Nashville also. Almost the exact same wording as above! I just received this letter 9/13. It has a Birmingham return address and asks for $9500 in Bitcoin. I uploaded it onto the FBI website, but have heard nothing from the FBI. Just received one here outside San Jose, CA postmarked 5-11-18 from Memphis TN from BlueSun~##; I’m not a bitcoin person…. Just received the same lette today in Oklahoma. What a joke. Ours is demanding $15,700! I got the same letter today in Bay Area, postmarked Nashville TN 370 09 JUL 2018 and asking $8,850. I received the same e-mail today. What concerns me the most is that they used my name and a password. I know they have no fun videos of me to show but I am worried about security online. Does this mean that my personal info has been accessed and/or they can hack others I’ve emailed? If you own a home your name is already online. With the Equifax breach, your name is out there. Just to name a few. And no, unless you opened a strange link and gave them a password, they can’t get to your email. Received my letter today in Houston from RedMeat73 looking for $15,950. Stamp was cancelled, but no postmark. Kind of cute, like a junior high science project. We live in CT and received it today, July 23, postmarked Nashville. Asking $15,150. The “shaming” attempt sounds foreign. “choose this path”… “misdeeds”. I just hope I can help another potential victim see this and not pay. If you get the letter, don’t worry about it! Do not pay these motherless f***s one red cent! I received the same letter yesterday in Salt Lake City, Utah. They asked me for $15,750. I’m trying to figure out why they wanted more out of me than anyone else – it’s definitely not because I’m rich! Ha ha. well I think we have you beat, our demand was from RedMeat73 for 29,300! We recently received what looks like an ‘offer’ from CVS – that includes a ‘check’ for some $1800+. The letter requests the recipient to buy $1500 worth of prepaid credit cards, then take some survey and I don’t know what else. 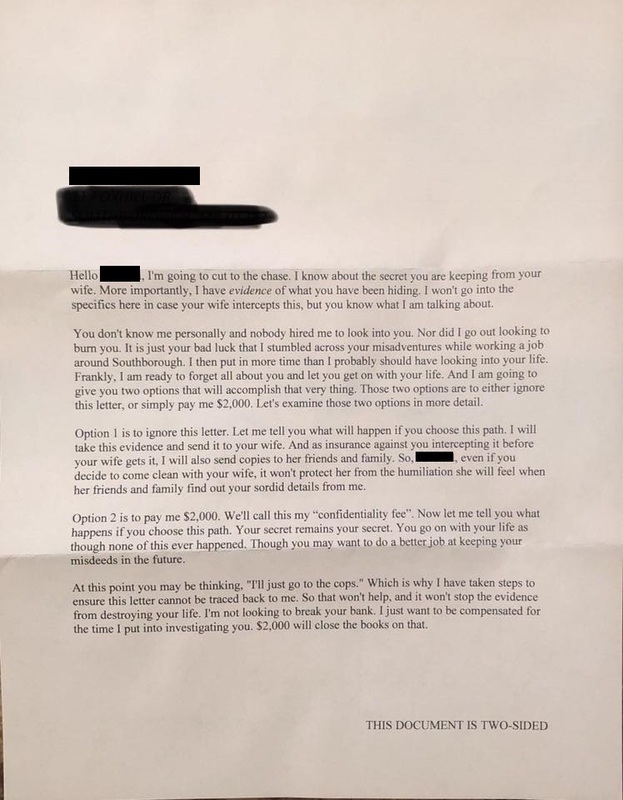 I received the same exact letter today in the Chicago suburbs. They asked for $9100.00. It was postmarked from Knoxville, TN. I called the FBI and they said to upload it to their internet-crime reporting page. The rep said they get about 3 calls a day for this type of thing. I got one today. I reported it to the FBI, and USPS. Mine was from Nashville. Asked for $9,000. BadHeart11. I don’t know where they got my information, but it wasn’t from any place I can think of. Every place I put my full name, Steven. They called me Steve. So it wasn’t LinkedIn, Equifax, or any other place. Next time I am at the FBI field office I might quiz one of them on this. Of course it comes 1 week after I was there. Go figure. Just got mine today in North Carolina also a from Nashville asked for $8700. What a looser! !